Productivity, in any situation, is being able to do a number of things in just a limited amount of time. In sales, it simply means being able to make a lot of sales within a certain time, depending on the sales goals of a business. However, not everyone in sales actually sells directly like the sales representatives. In this case, productivity is a bit difficult to quantify. Sales productivity can be attained in many ways: being organized, good time management, and using the right kind of technology to achieve convenience. 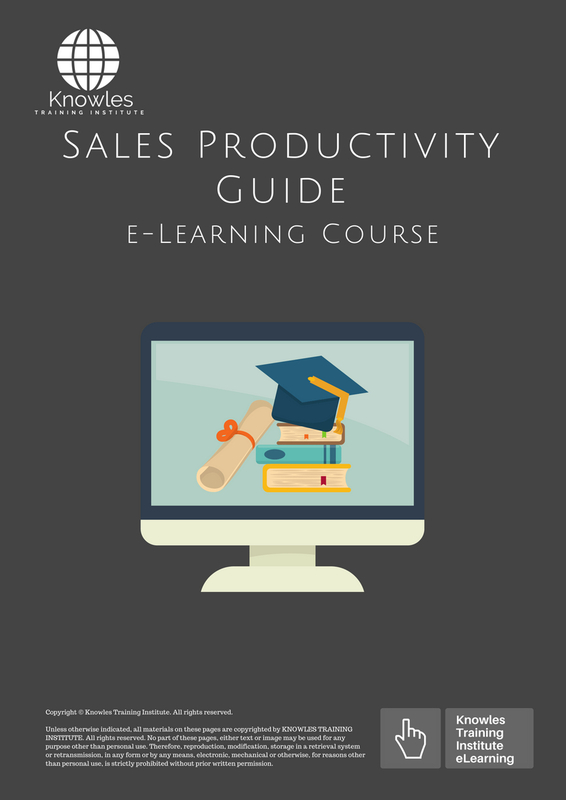 This course will incorporate these ways into techniques that will improve sales productivity. It will also teach the participants with the tools to gauge productivity. Both sales managers and sales representatives will also be provided with a checklist of tips and exercises that require practical applications. 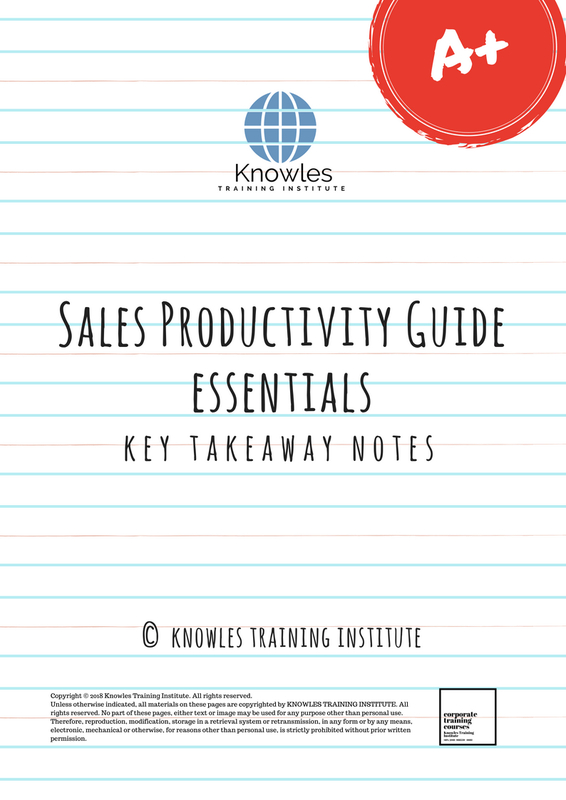 This Sales Productivity Guide workshop is ideal for anyone who would like to gain a strong grasp and improve their Sales Productivity Guide. The duration of this Sales Productivity Guide workshop is 1 full day. Knowles Training Institute will also be able to contextualised this workshop according to different durations; 2 full days, 1 day, half day, 90 minutes and 60 minutes. • Introduction: What does productivity look like in other areas of business? 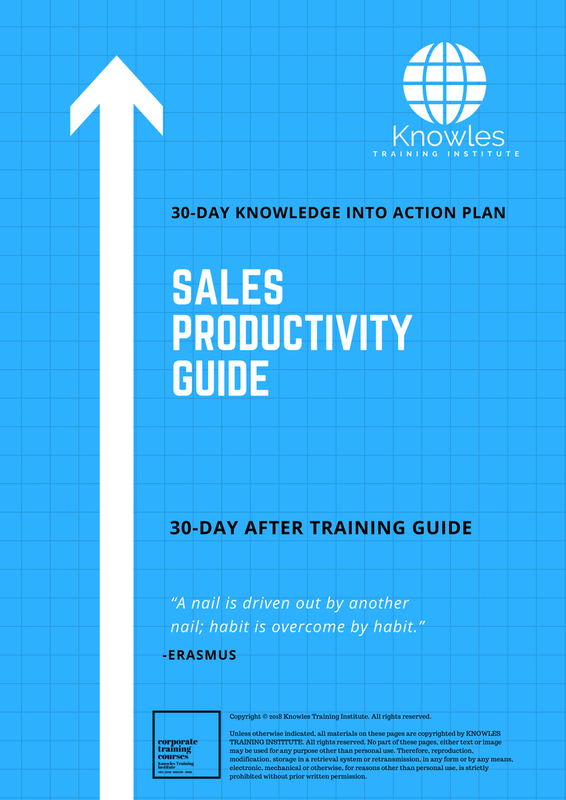 • What does sales productivity mean? • Sales productivity vs sales efficiency vs sales effectiveness: Is there a difference? • How do you measure your sales productivity and your team’s? • What are the tools you can use to improve your sales productivity? • What are the common problems that inhibit the increase in sales productivity? • Activity: Given the following sales-related work situations, what should you do to increase productivity? 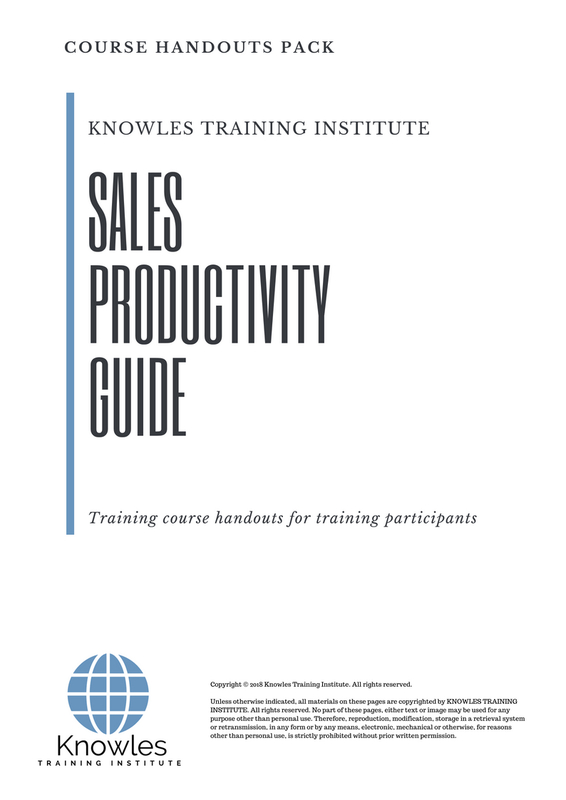 There are 3 pricing options available for this Sales Productivity Guide training course. 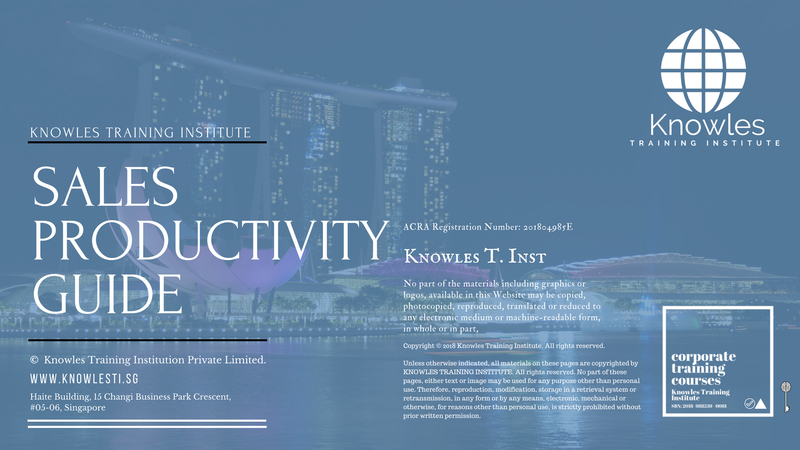 Course participants not in Singapore may choose to sign up for our online Sales Productivity Guide training course. 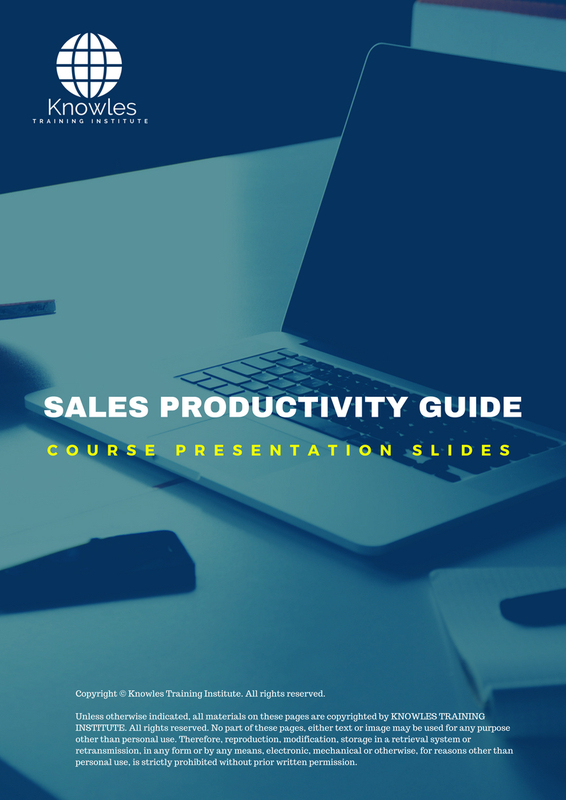 Request for this Sales Productivity Guide course brochure. Fill up the short information below and we will send it to you right away! 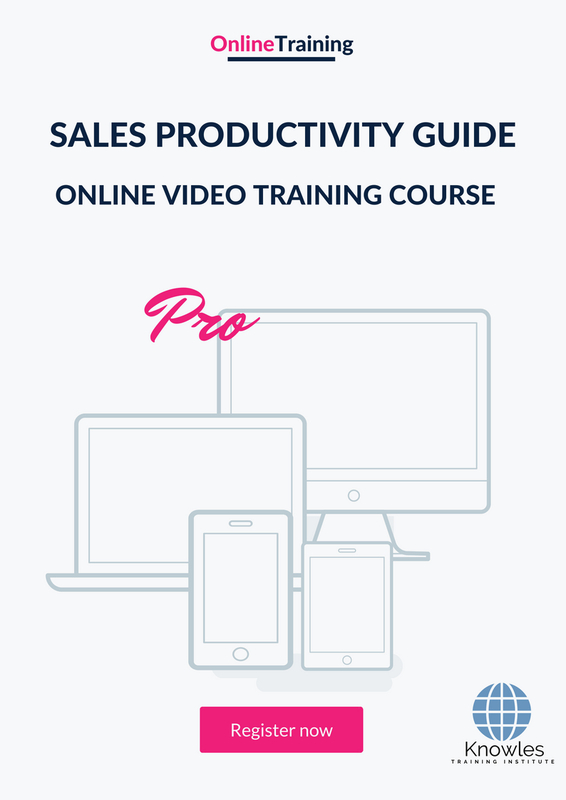 Register For This Sales Productivity Guide Course Now! 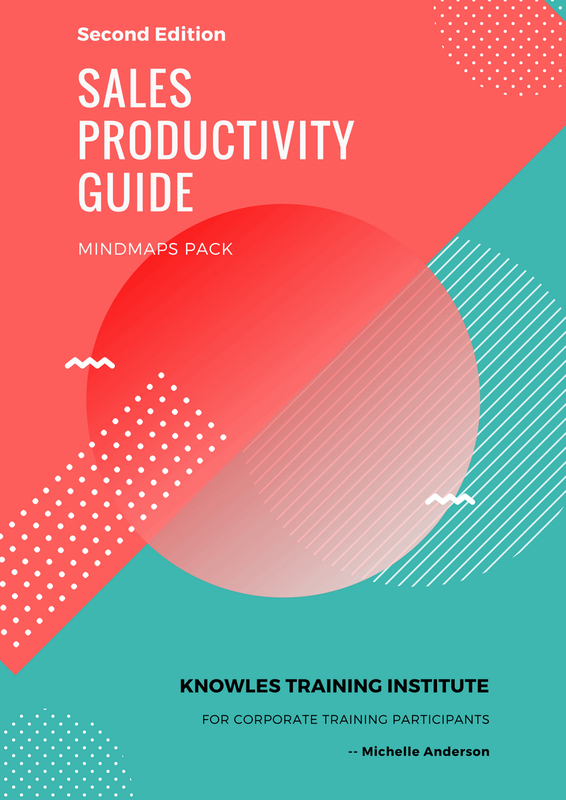 Share This Sales Productivity Guide Training Course! 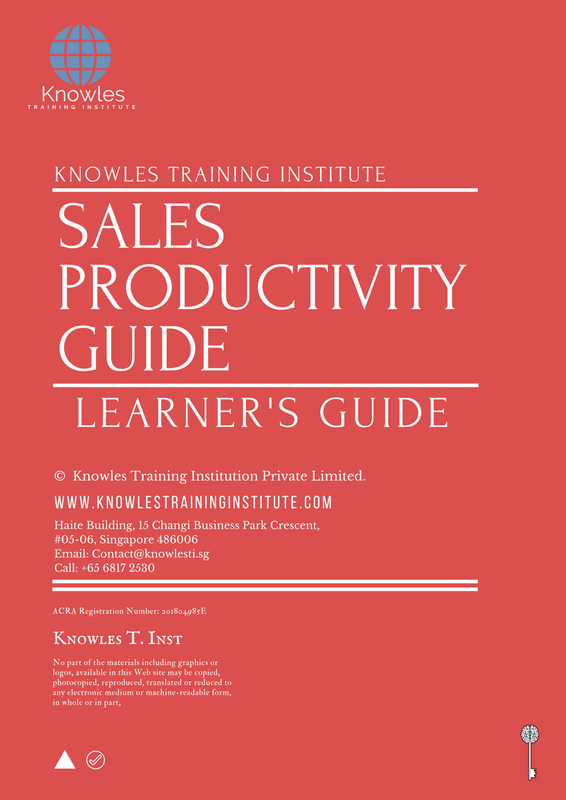 Sales Productivity Guide course, workshop, training, class, seminar, talk, program, programme, activity, lecture. 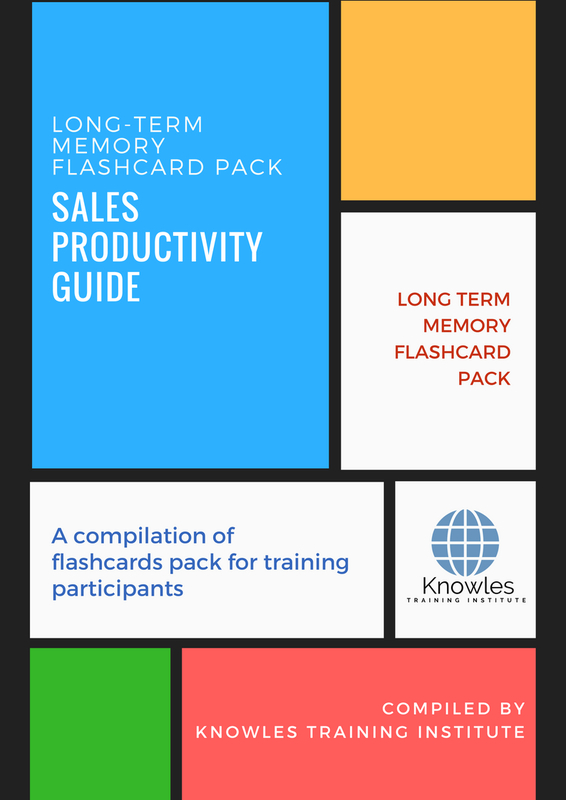 Sales Productivity Guide courses, workshops, classes, seminars, talks, programs, programmes, activities, lectures in Singapore. Sales Productivity Guide improvement tips, Sales Productivity Guide techniques, improve Sales Productivity Guide, improve Sales Productivity Guide games, Sales Productivity Guide improvement exercises, improve Sales Productivity Guide power, how to have good Sales Productivity Guide, how to have good Sales Productivity Guide in studying, how to build up your Sales Productivity Guide, how to improve Sales Productivity Guide how to improve Sales Productivity Guide course in Singapore. Enhance, boost, build up, enlarge, heighten Sales Productivity Guide course in Singapore. 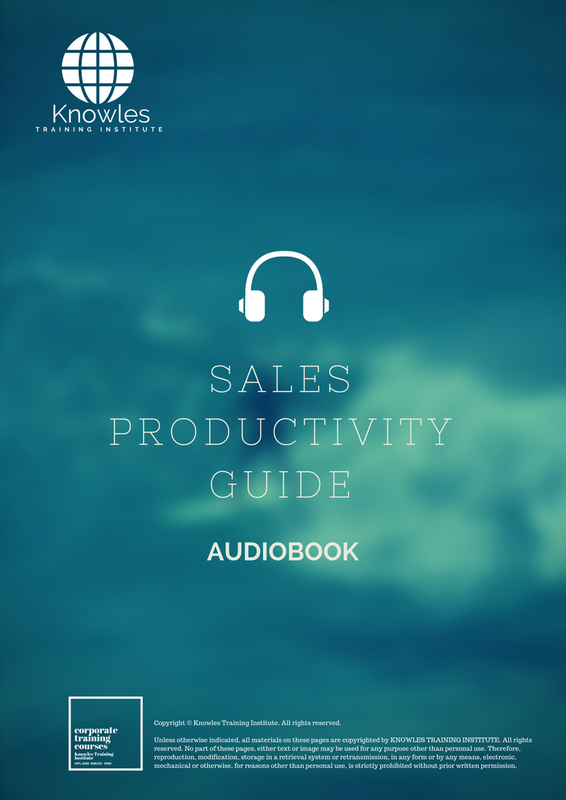 Increase, intensify, raise, reinforce, strengthen Sales Productivity Guide. Upgrade, amplify, boom, elevate, exaggerate, magnify, grow, gain Sales Productivity Guide. Develop Sales Productivity Guide, multiple, power up, beef up, bolster, establish, extend Sales Productivity Guide. Invigorate, restore, step up, toughen, empower, fortify, regenerate Sales Productivity Guide. Rejuvenate, renew, escalate, expand, maximize Sales Productivity Guide. Powerful, mighty, impressive, competent, great, excellent, exceptional Sales Productivity Guide in Singapore. 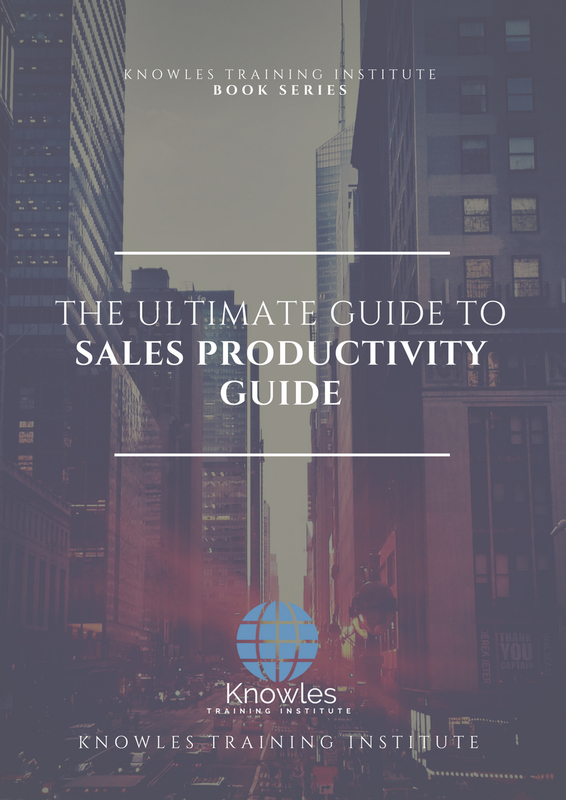 Superb Sales Productivity Guide. Super, superior, strong, solid, active Sales Productivity Guide training courses and workshops in Singapore. Sales Productivity Guide enhancement, booster, building up, enlargement, heightening, increment, strengthening, amplification. Sales Productivity Guide magnification, growth, development, power, empowerment, regeneration. Sales Productivity Guide rejuvenation, development, escalation, expansion. 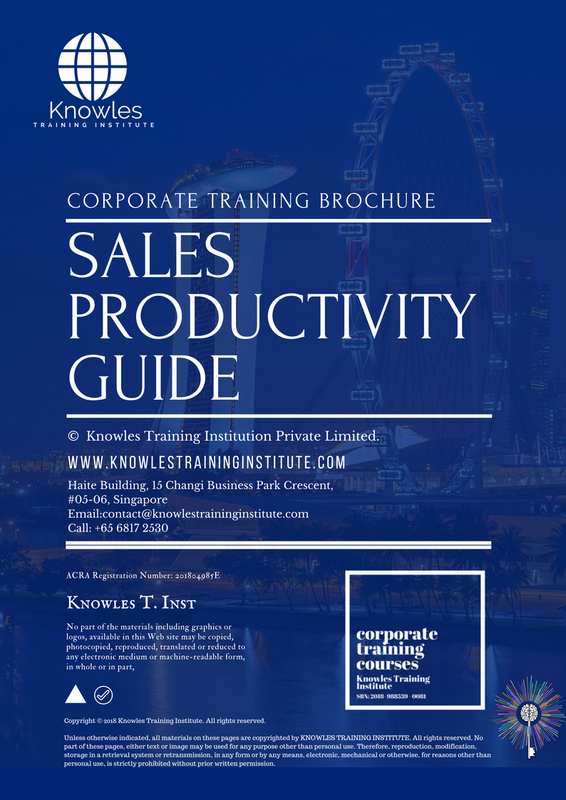 Sales Productivity Guide maximization, power training courses & workshops in Singapore.